There are all sorts of things going on at Comic-Con having to do with comic books, movies, TV shows etc. But what we are most interested in is of course everything related to Vampire Academy. First and foremost, Richelle Mead is attending Comic-Con! She posted her schedule for the weekend on her blog, here. Another cool thing is that you can get Vampire Academy tattoos at the Penguin Booth! 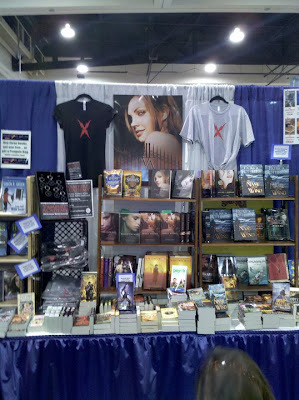 Penguin Teen tweeted the info earlier today, and it's booth 2913R, for those of you going to the Con. I'm so jealous of all of you who get to go! For the last few years Comic-Con has been a big Twilight event, and I'd of course have loved to go then, but it wasn't until I heard that Richelle was going that it occurred to me that all these wonderful authors are also at Comic-Con, which makes me want to go even more! And totally btw, Stacia Kane is a friend of Richelle's, and I've recently read her wonderful Downside books (Unholy Ghosts, Unholy Magic, and City of Ghosts coming out next week). I really recommend these books! I am too, jealous! It would be amazing to meet the people behind the books you love, a dream come true actually. I was so jealous of everyone who got to go to comic con-it sounds like it was such a fun time! All publicly recognizable copy, images, video, etc. are the property of their respective owners. We are simply fans musing the series. The css, main code and graphics were made by us (unless otherwise stated), so please do not copy or steal anything. If you want something, ask first. This page is best viewed in Firefox, 1024x768+.